The Spa & Beauty Clinic is based on Red Lion Street in Goole, East Yorkshire. They have one of the largest, unrivalled salons and medispas in the area. Due to the addition of their new spa and the subsequent rebrand from The Solarium & Beauty Company, The Spa & Beauty Clinic required a new website. We designed a modern website for The Spa & Beauty Clinic making use of their new logo and existing colour scheme of black, white and silver. The website features modern fonts, line icons and high-quality stock images. The website is built using WordPress and is fully responsive which means it looks good and works well on all size devices including desktop PCs, tablets and smartphones. 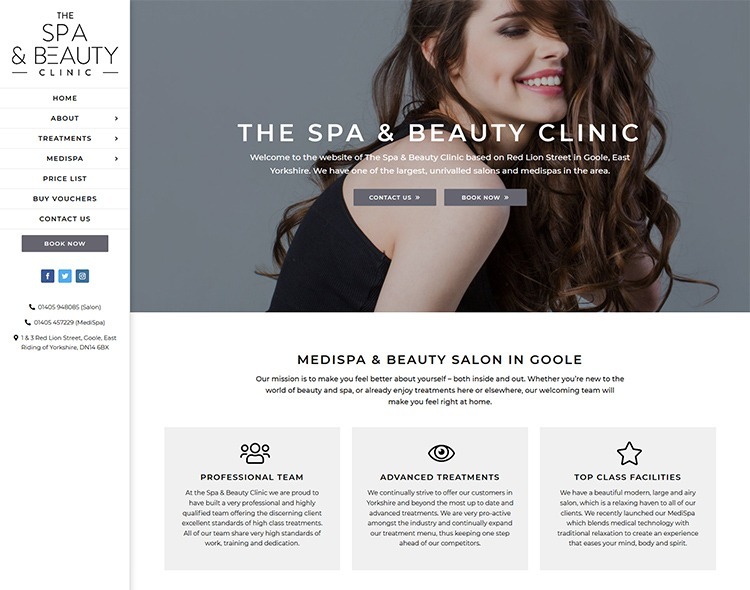 We carried out SEO work on the website to ensure it ranks well on Google for the business’s main keyword phrases such as “beauty salon goole” “spa goole” and “mediaspa east yorkshire”. The main call-to-action on the website is the “Book Now” button which takes the visitor to The Spa & Beauty Clinic’s booking software and from there they can easily book an appointment at the clinic. The website also makes it very easy for visitors to contact the clinic should they have any queries. Since launching the website The Spa & Beauty Clinic have experienced a large increase in the number of online enquires they receive.